A Rolling stone gathers no moss but sometimes lawns will. 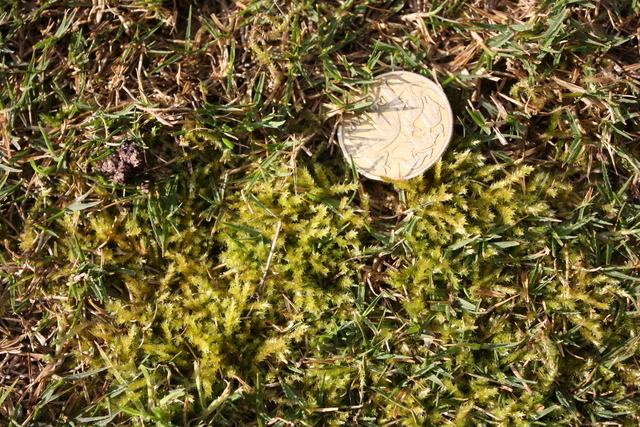 Moss can be a problem in lawns during winter and early spring. In many instances the moss disappears over summer leading the lawn owner or custodian to believe their problems are gone. That is usually far from the truth. Areas that are prone to moss and algae invasion are normally either poorly drained, heavily shaded, compacted or a combination of these problems. Incorrect PH is also a catalyst for moss invasion when coupled with shade, or poor drainage. Add to this the fact that mossy areas generally become hydrophobic (water repellent) in summer and you can see that warm weather is not the entire panacea for returning the lawn and soil to good health. Take action to fix the problem as soon as possible. Your first action should be to rake out the moss as much as possible. Follow this up with aeration by coring or inserting a garden fork into the affected areas to a depth of 80-100mm. Rock the fork back and forth to break the hard compacted soil without digging up the lawn. Instead of a round hole where the fork was inserted you should now have an elongated hole about 25mm long. Warm season grasses such as Sir Walter, Nullarbor couch and Eureka Kikuyu should bounce back from this process. Cool season lawns such as Tall Fescue, Ryegrass, or Kentucky Bluegrass may need to be patched up with seed or new turf if the raking has left the area bare. In spring lightly topdress the lawn with sand or sandy loam topsoil that is devoid of clay following aeration. If the area is extremely wet in winter or at any time consider adding drainage to get the moisture away. Constantly wet areas are devoid of air in the rootzone and roots will not flourish under these conditions. Sulphate of Iron and Copper Sulphate can be used to temporarily kill moss and algae however if the underlying cause is not treated the problem will return again and again. Be careful not to over apply Sulphates as they can burn the plant if applied at the wrong rate and method. So fix the problem now and ensure that your lawn is not the only Rolling Stone Lawn that “Can’t get no satisfaction” and gathering moss.